GhostChain ensures its safety based on special patented technology and security power. Color Code is a core technology of Ghost Core Platform. What is Color Code of Ghost Chain? “The core technology of Ghost Core Platform"
It is the core technology of Ghost Core Platform and refers to code that combines and encrypts the colors of light. Encrypted color code values are created in infinite random form rather than fixed values and have a very organic structure. It creates endlessly infinite random numbers just as if it were alive. The random number value is used only once for thorough security purposes. Because of this, when hacking and illegal intrusion are detected, it has aggressive security that infects endlessly exposing and infecting a false infinite number of encrypted random numbers, and infiltrates and disables hacking programs. This is the source blocking system for the hacking of Ghost Chain Container Technology, It is a complete security system, packaged by level from the development technology stage to the multi-unit process. The device’s(mobile, etc) touch panel is linked with a physical, autonomous encryption code, so that it is readily available to the public. Color Code based on the core technology of this Ghost Chain Security System will create a new ecosystem that fits into the 4th industrial revolution. With this compensation system, many users will receive fair labor and reasonable rewards, which will soon share the value of the "Mining Color Code" in connection with the mining ideology of the blockchain. The past marketing style that have just judged the success of marketing with the number of sales are not right now. Today, we measure consumer behavior patterns from digital marketing to performance, and we have come to predict customer buying behavior online. In the future, marketing will become more complicated and subdivided in line with the ad technology that is combined with advertising and technology. Companies are also making efforts to interact with customers through more diverse analytic. 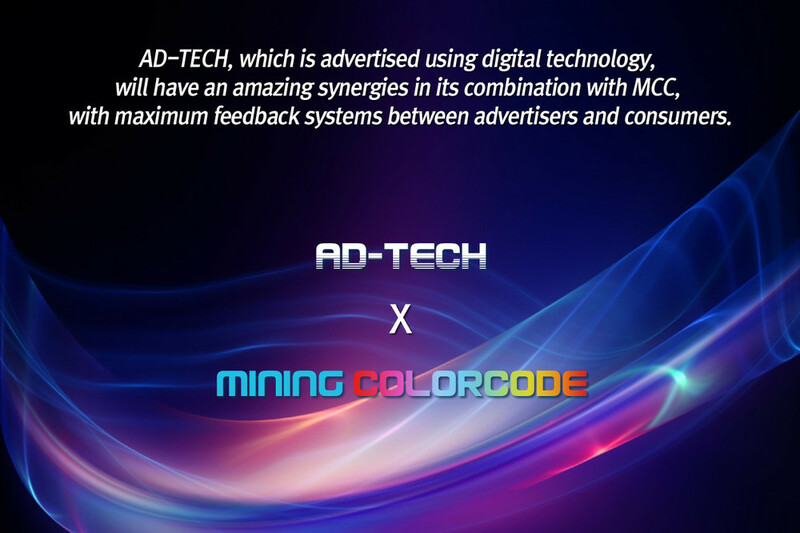 The way the Mining Color Code presents will offer another alternative to interaction between the company and the customer. In addition, it will have a huge impact on the existing advertising market, and a new advertising ecosystem will be created through the maximized compensation system. Users watch advertisements on personal devices(smartphone, etc). Through that activity, energy (time, power, communication costs, etc.) will be consumed and rewarded. Soon, the new compensation system, Mining & Ad-Tech, is very easy and accessible. Mining Color Code is designed to mine the contents of the advertising area, and are designed to fill areas of the chromosomes lacking in DNA. The way it works is by sliding the color code through the mining process and then the ad will play until the chromosome is 100% complete. Progress is displayed for each DNA, and the progress is improved by filling the empty space of DNA. By combining mining effects with ads, users can participate in mining directly by watching ads. As followers increase, you can increase your compensation MCC. There is no limit to followers, so a large number of followers can maximize revenue. Free users can also switch to paid, and you can expand your revenue with the same follower functionality. If a charged user's follower becomes a charged member, a portion of the total compensation from that follower group will also be received as a commission. The unit of compensation obtained through the mining color code is marked by the MCC. The collected MCC is then converted to another encryption currency you want through Ghost Wallet. Ghost Wallet is a safe personal wallet with a Ghost Chain Safety Asset System and is a faithful exchange by applying escrow to individual transactions. In Ghost Wallet, the MCC can be exchanged for Ethereum or Bitcoin and exchanged for cash. receive energy consumption and a reasonable reward.